Bagdogra Airport, (IATA: IXB, ICAO: VEBD) is an international airport located about 16 km (9.9 mi) west of the city of Siliguri, 45 km (28 mi) away from Jalpaiguri and 65 km (40 mi) away from Darjeeling, the cities which the airport mainly serves, at Bagdogra in Darjeeling district in northern West Bengal, India. It is operated as a civil enclave at AFS Bagdogra of the Indian Air Force. It is also the gateway airport to the hill stations of Kurseong and Kalimpong and other parts of the North Bengal region and sees thousands of tourists annually. The airport is a major transport hub in the region with flights connecting Kolkata, New Delhi, Mumbai, Chennai, Bangalore, Hyderabad, Ahmedabad and Guwahati and has international connectivity with Kathmandu, Paro, and Bangkok. The airport also has regular helicopter flights to Gangtok, the capital of Sikkim. The central government of India conferred customs airport status to the airport in 2002 with limited international operations. Air traffic at Bagdogra crossed 1 million for the first time growing at 43.6% percent in 2014-15. This is one of the few airports in India with zero sales tax on aviation turbine fuel. The airbase is home to the IAF No. 20 Wing, as also to the Mikoyan-Gurevich MiG-21 (Mig-21) FL fighter aircraft of the No. 8 Squadron and a Helicopter Unit. 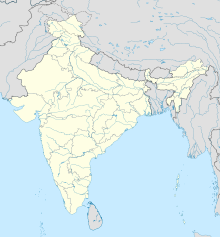 Along with the airbase at Hasimara, Alipurduar district; it is responsible for combat air operations over a large area including North Bengal, Sikkim, and if needed, Bhutan. The base caters to all military air traffic for the Indian Army's XXXIII Corps based nearby in Sukna. The state government had handed over 14.5 acres (59,000 m2) of land to the Ministry of Civil Aviation for developing infrastructure for night landing in 2010. AAI also expanded the apron at the same time, enabling the parking of 5 Airbus A320 class aircraft simultaneously. The IAF, which maintains the ATC and runway, gave permission for night landings by civilian aircraft allowing flights past 6 pm in 2013. ^ "Traffic News for the month of March 2018: Annexure-II" (PDF). Airports Authority of India. 1 May 2018. p. 4. Archived from the original (PDF) on 1 May 2018. Retrieved 1 May 2018. ^ "Traffic News for the month of March 2018: Annexure-IV" (PDF). Airports Authority of India. 1 May 2018. p. 4. Archived from the original (PDF) on 1 May 2018. Retrieved 1 May 2018. ^ "Bagdogra backs CM flight path- Tax waiver fuels air traffic growth". The Telegraph (Calcutta). Retrieved 27 July 2015. ^ "AirAsia India Launches New Daily Direct Flights From Bengaluru To Bagdogra At Rs 2,999 Only. Booking Details Here". Ndtv.com. Retrieved 7 August 2018. ^ "Vistara expands its wings to Dibrugarh, connects this Assam city with Delhi, Bagdogra." Financial Express. Accessed 01 March 2019. This page was last edited on 17 April 2019, at 15:31 (UTC).